Synthetic peptide conjugated to KLH derived from within residues 150 - 250 of Mouse Zfp57. This antibody gave a positive signal in wild type mouse ES cell lysates. Our Abpromise guarantee covers the use of ab45341 in the following tested applications. WB Use a concentration of 1 µg/ml. 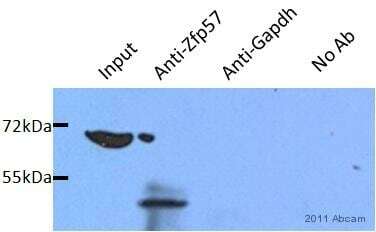 Detects a band of approximately 57 kDa (predicted molecular weight: 48 kDa).Can be blocked with Mouse Zfp57 peptide (ab45340). Zfp57 is a putative transcription factor that is a marker of mouse embryonic stem cell pluripotency, the expression of which decreases in the absence of LIF. Western blot - Anti-Zfp57 antibody (ab45341)Image courtesy of Dr Nozomi Takahashi, Ferguson-Smith Lab, University of Cambridge. Publishing research using ab45341? Please let us know so that we can cite the reference in this datasheet. Inquiry: I am running Western blots with rat brain samples using ZFP47 antibody (ab45341), as well as KAP1 antibody (ab22553) and pS473-KAP1 antibody (ab109545). I wonder whether these antibodies have been tested for their specificity (e.g. using knockout/knockdown tissues, using tissues known to not express these proteins). Thank you! Thank you for contacting us. No, these antibodies have not been tested with overexpression or knockdown cells. 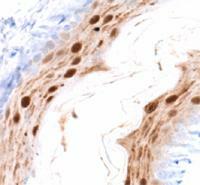 I ordered and have been using antibody ab45341 (ZFP57). I am getting a band in the correct rage of approx 70kda, however I am also getting a band around 105kda. It has the same pattern as the 70kda band, and I was wondering if you had any idea as to what it might be? Any help would be greatly appreciated. These are rat brain samples. Our testing did show a band at this range in mouse brain lysate as well (https://www.abcam.com/Zfp57-antibody-ab45341.html#ab45341_1.jpg) that we were not able to identify. To our knowledge, this product has not previously been tested in rat however taking into account the appearance of a band at this weight in our mouse data, this effect is not surprising. Thank you for contacting us. Unfortunately it is unlikely that ab45341 works in Human (poor sequence homology). Thank you for sending us the reference of the publication in which ab45341 was used. About ab50944, you mentioned that another lab did not get satisfactory results in ChIP. Unfortunately we currently do not have any other anti-Human Zfp57 in the development pipeline. 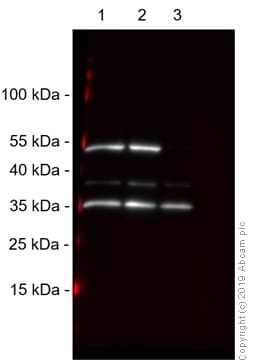 However, if you want to test this antibody in ChIP, I can offer a discount off a future purchase if you buy ab50944 now, test it in ChIP and submit feedback to us in the form of an Abreview. It doesn’t matter whether the Abreview is positive or negative, we would just really like to receive your feedback. The discount would be to the value of 1 free primary antibody. If you are interested in this offer, please follow these steps: 1. Reply to this e-mail to let me know that you would like to proceed and test ab50944 in ChIP. I will then send a discount code. This code must be issued before purchasing ab50944 so please wait for my reply before ordering. 2. Purchase ab50944 either by phone, fax, or online (www.abcam.com). 3. Test it in ChIP. 4. Let us know the results, positive or negative, using our Abreview system (this will take about 10 minutes and images are great if you have them!). To find out how to submit an Abreview, please visit: https://www.abcam.com/abreviews. 5. After the review is submitted to us, the discount code becomes active. Simply place your new order by phone, fax, or on the web and mention the discount code. The discount can be redeemed for any primary antibody ordered and the discount code is valid for 4 months after issue. We are always pleased to obtain feedback about our products and any information is greatly appreciated! Even if ab50944 turns out to be unsuitable for ChIP, you will still receive the discount on your next purchase after your Abreview has been submitted. Please let me know if you have any questions about this offer and I would be happy to help you further. The Terms and Conditions of this offer can be found at: www.abcam.com/collaborationdiscount.